This workshop is for anyone between the ages of 9-12 who is interested in learning about responsible ways to care for pets and how to help animals in their communities. This workshop includes a tour of the shelter and interactive lessons on responsible pet care, pet overpopulation, animal communication, and safety around animals. 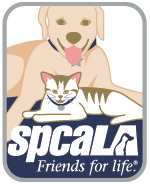 It is 2 ½ hours long and includes a snack, spcaLA give-a-ways, and an spcaLA Friends for Life iron-on patch. Each registration comes with a pdf download of a packet of activities that participating children are invited to complete before or after the workshop. A link to the pdf will be emailed to you upon registration. The packet consists of the activities listed below. TAKING CARE OF BUSINESS Take care of a pet — yours or someone else’s (friend, neighbor, family member, etc.) — for two weeks. Worksheets are included in the registration packet to help you plan and track your responsibilities. Making a difference — How can you support an organization in your area that helps animals? Note: If you are interested in pursuing an award in the future, we recommend completing this activity because it will help you start to create a plan to help an organization. Possible Pets — What kinds of pets would you like to own? Pets and Vets — How can you make sure your pet stays healthy and happy? Healthy Eating — What kind of food is best for your pet? The cost of this workshop is $15.00 per student. Full or partial participant cancellation must be received three weeks prior to your scheduled workshop date to receive full refund, minus a 10% processing fee. Cancellations received fewer than three weeks prior to your scheduled workshop are not eligible for a refund.